CRUCIAL CONNECTION — Sandia researcher Leonard Martinez, at the “friendly” EMP emitter facility called the ElectroMagnetic Environment Simulator, connects a high-voltage-insulating line that circulates oil between a coaxial transmission line (white tube on the left) and the blue oil-filled transmission horn. Fortunately, military equipment is designed to be immune to various levels of EMP, and the validity of its designs — and some civilian designs as well — has been tested and improved by a “friendly” EMP generator installed in a recently renovated facility at Sandia. The idea is to explore the effects of the energy pulse by testing an item at critical moments during its processes. Learning when and where a problem may occur in the unit permits engineers to design better EMP shielding to prevent such upsets. 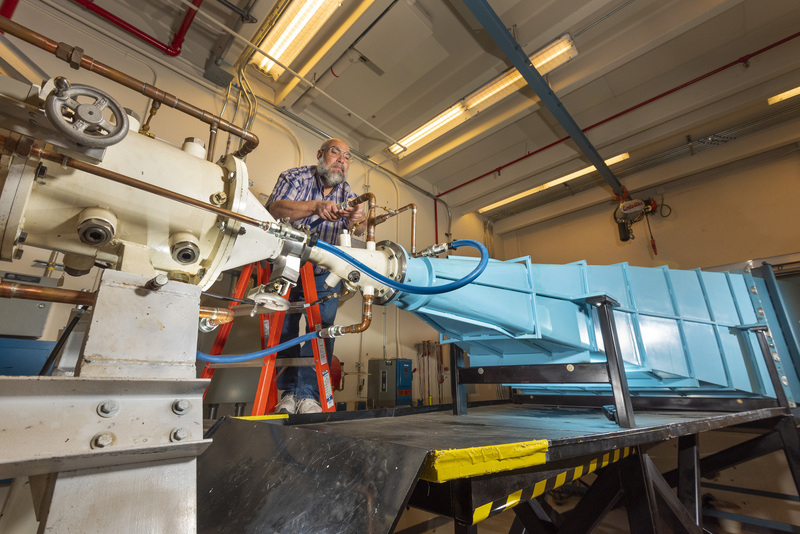 Sandia’s EMES testing process involves trundling components into the target area, subjecting them to the rapidly peaking EMP and then removing them to make way for the next item to test. Preliminary results are provided immediately, Leonard said, and a longer report with more extensive analysis is issued later. “The builders or owners generally solicit help from my group when it comes to additional shielding designs,” Leonard said. The design focus can range from protecting tiny electronic parts to shielding larger subsystems of military equipment. If the device passes the specification level test at normal energy requirements, its owners may ask the test facility to increase the EMP electric-field amplitude in incremental steps to determine the device’s capabilities at higher threat levels. “This gives the customer a better level of confidence about their product,” Leonard said. Earlier versions of the pulse-producing machine operated from 1978 to 1994. The test facility lay fallow until after the 9/11 attacks, when it was resurrected to test communications across the nation in the event an adversary could generate an EMP in or near the United States. “‘Could we still communicate? Would our radios, televisions, microwave ovens and refrigerators work after such a pulse arrives,’ was the question,” Leonard said. The renovated facility was intended to support the NNSA mission but over time came to satisfy military missions and civilian needs. It continues to do so. Sandia researchers are working to integrate EMES into a national EMP test facility focused on increasing the resiliency of the nation’s electric grid.